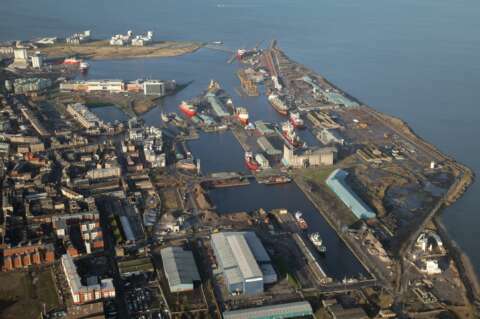 The Port of Leith is ideally located within the Forth Estuary on the East Coast of Scotland for all North Sea Oil and Gas activities and has earned a well-deserved reputation for its reliable service and high quality support facilities for offshore developments. Leith is also the largest fully enclosed deepwater port in Scotland, with a Panama standard lock entrance ensuring calm water within the port. Leith has the capability of handling ships up to 50,000DWT and continues to act as a key subsea mobilisation port for many companies. Top international marine contractors in the oil and gas pipeline industry regularly choose Leith for a wide variety of projects owing to the port’s expertise and ability to offer large areas of ground and dedicated berths for specialised mobilisation and demobilisation work. The Port of Leith has connections with many companies that offer a collaborative approach to delivering customer solutions. Leith is a locked Port and therefore no tidal range. Cill Height is -6.71m Below Chart Datum. Planning approval has been granted for the demolition of the grain silo which is situated opposite the Imperial Dock. Clearance of this unused building opens up approximately 16 hectares of land next to a deep water berth creating excellent logistics opportunities for renewables, oil and gas and late life operation.